Seb's hip score was 4:4=8. He was last eye tested clear for PRA in 1989. 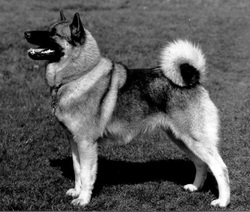 Seb was lightly used at stud, siring only four litters, but became the sire of two Champions and two other holders of Stud Book Numbers. 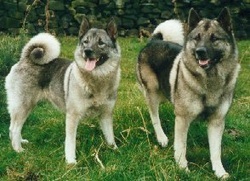 Seb was the son of our first elkhound, Tara, from a repeat mating to Loki, the sire of three Champions. He won many prizes as a puppy, and his Junior Warrant. Seb's promising show career was severely curtailed when he suffered a mild attack of distemper, apparently caused by the breakdown of the distemper vaccine by the parvo vaccine which was being used at that time. Seb was out of the show ring for twelve months. At this time he would only drink spring water which Stuart brought to him each day from a natural spring in the hills near our home. Seb's subsequent show career was spasmodic due to a sebaceous cyst problem, although he gained his title. He needed operations to remove the cysts as they tended to burst under the skin, and he could not be shown until his coat had grown back. Fortunately, this condition was not inherited by any of his siblings or offspring. 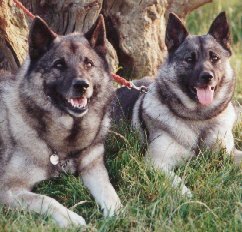 Seb was a calm and patient dog, friendly with most other males. He and Ch. Llychlyn Morgan, another male of gentle disposition, used to flop together side by side at shows! Seb passed his good temperament on to his offspring.